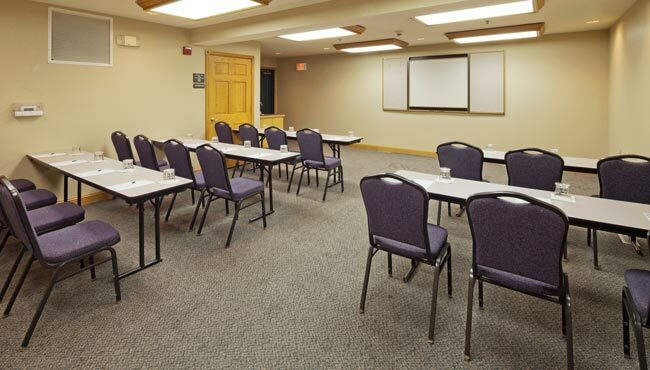 For a great venue right off I-43 and moments from Lake Michigan, reserve one of the four meeting rooms at the Country Inn & Suites, Port Washington. Host a small training session in the Boardroom or a large social gathering for 450 people in the Lakeview Conference Center. In each meeting space, delegates can have access to free high-speed Internet, customized catering and audiovisual equipment. Our conference center is also a great option for wedding ceremonies and receptions. Start planning your event today! Staffed with a dedicated coordinator for before and during your event, the Lakeview Conference Center hosts everything from wedding receptions to business seminars. For a more intimate space, the conference center can be split with a soundproof wall. Popular for parties and informal company events, the Critics Corner Pub features live music, a full-service bar and complimentary popcorn. Your guests will love the relaxed atmosphere and sports-oriented decor. Reserve this room for pre-game team talks or small training sessions. Because the space is connected to the breakfast room, meeting planners can request that it be expanded to accommodate more people. Ideal for interviews, depositions or important meetings, our off-site executive boardroom includes a table and comfortable leather seating for 10 people.